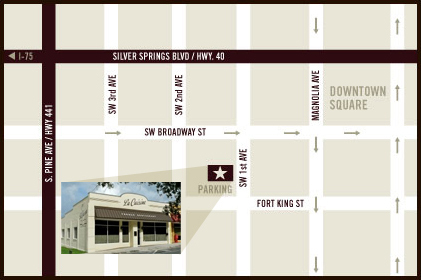 Located at the intersection of SW 1st Avenue and Fort King Street. La Cuisine is just one block away from the Ocala Square, right beside Pi on Broadway and the Ocala Wine Experience. La Cuisine has its own parking lot, you can also use the Downtown Valet for only $10, located on the square.